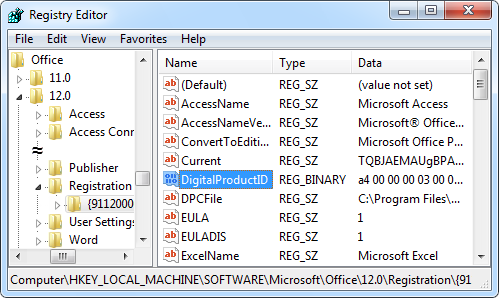 Changing the product key for Office 2010 or Office 2013 does not require access to the registry, either directly from the control panel or through the command line. To make changes through the control panel, open the Add/Remove Programs applet (Windows XP) or the Uninstaller applet (Windows Vista, Windows 7, Windows 8, or Windows 10). Find your Office 2010/2013 application and press Change. The installer will now begin with the Enter Product Key option, which allows you to enter a different product key. You can also change the product key through the OSPP.VBS script. Instead of using the /dstatus switch, you must replace the product key value with the /inpkey:value switch. Right click on the key, choose Export… and save the file to for instance your Desktop. Each sub key stands for an installed Office application. The proper name for this identifier string is called a “GUID”. Click on the sub key to reveal its contents in the right pane. The SuitName key will reveal the name of the package that you have installed. If you have multiple GUID sub keys listed, you can use this key name to determine for which installation you’ll be changing the Product Key. Close the Registry and start Outlook (or any other Office application); you’ll now be prompted to fill in your Product Key and activate Office again. Delete the DigitalProductID and ProductID key to reset your Product Key.